With lots of places to set for Christmas dinner, it's time for me to start thinking about table decorations. 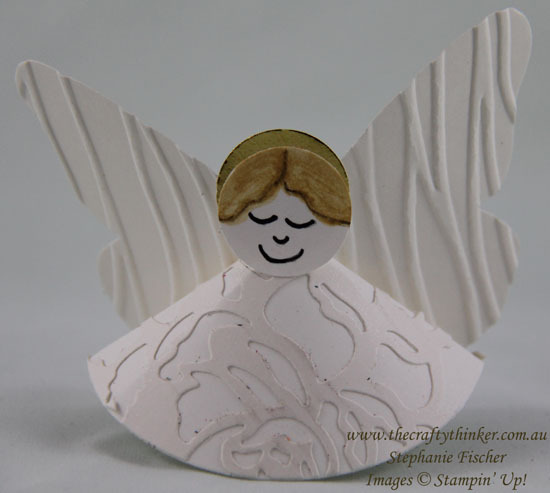 I'm not entirely sure whether this little angel will make the grade but it's certainly quick and simple! 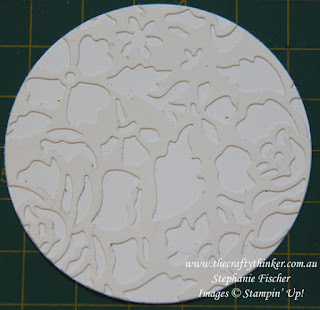 I should have either cleaned up the excess glue or scrubbed my cutting plate to prevent the grubby look! I cut some Shimmery White cardstock with the Detailed Floral Thinlit , glued it to a piece of Whisper White cardstock and then cut a circle with the largest of the Layering Circle Framelits. Then I cut out a wedge. 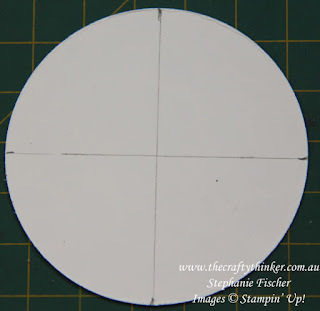 Only cut to the centre of the circle. 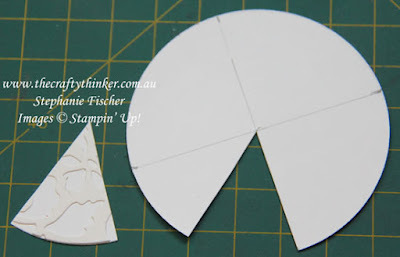 I folded the circle around to form a cone and glued it together. 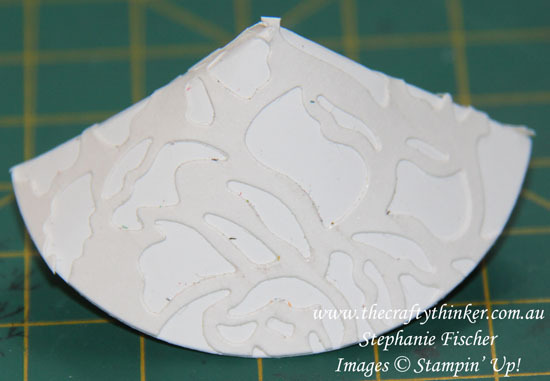 I then squashed it a little to flatten the cone slightly. I cut a piece of Shimmery White cardstock with the Bold Butterfly Framelit and embossed it with the Seaside embossing folder. 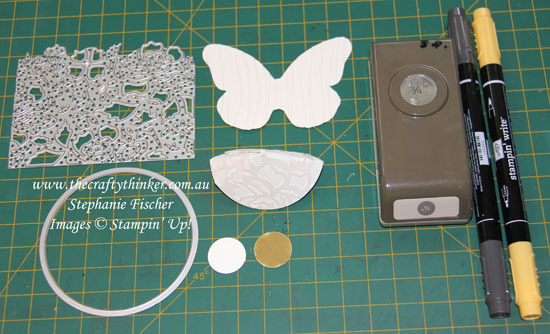 I then cut off the head and tail parts of the butterfly as shown. 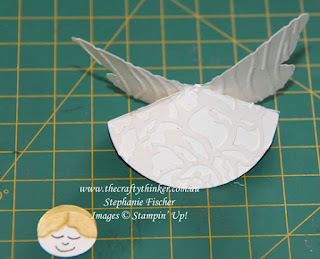 Once the head and tail have been removed, you're left with angel (or fairy) wings. 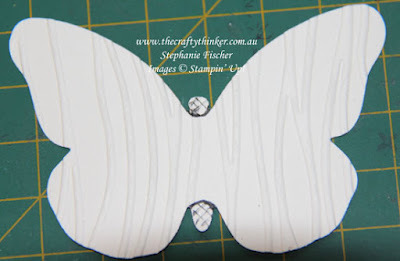 I then glued the wings to the back of the cone. The angel looks decapitated, but I was trying to show the construction process! For the head, I punched a 3/4" circle from Whisper White and also from Gold Foil, offset them a little to form a halo and glued them together. 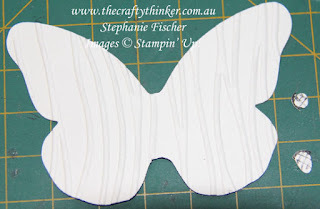 I drew a very simple face with a black Stampin' Write market and added hair with some more markers (I used So Saffron and Soft Suede) before adding the head to the body with a glue dot. I tried different hair colours.